Audrey and I visited the Shell Creek Airport on April 25, 2008 while traveling to Tampa. I have always observed DC3 aircraft while using Google Earth to check out the airport. Shell Creek is located about 6 miles northeast of the Port Charlotte Airport (Punta Gorda, FL). Using my Garmin and coordinates noted from Google Earth we arrived perfectly. After pulling into the first drive I came to I was greeted by none other than the legendary pilot Frank Moss. Having heard many stories about Mr. Moss it was a pleasure to meet him. Being from Miami Tower we discussed briefly departures procedures from Opa Locka Airport where Moss still flies DC6 and DC7 aircraft. The following pictures all came from Shell Creek during the visit. The Lockheed 12 is owned by Moss and being made ready for an appearance in a upcoming movie about Amelia Earhart. 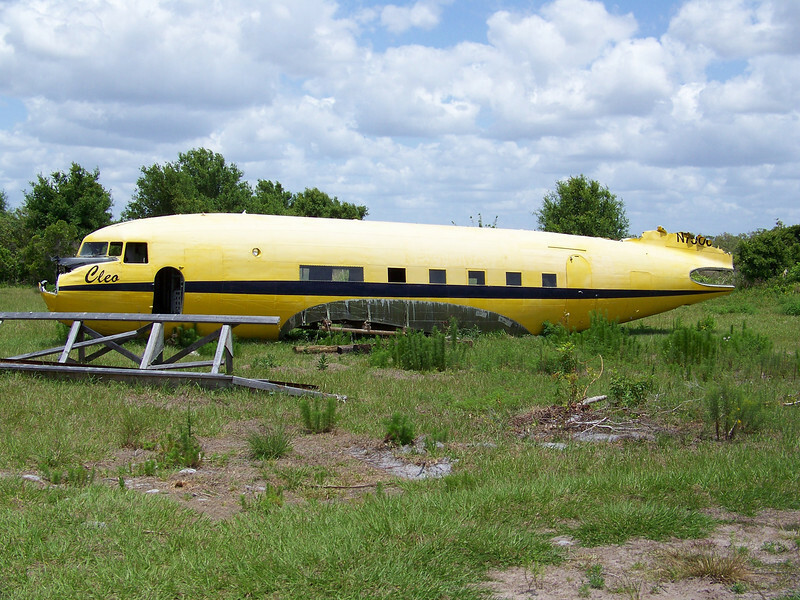 The broken up yellow DC3 once belonged to John Travolta. Enjoy! C-53D-DO, c/n 11693, 42-68766 D30Apr43 - Oran 05Jun43 - USA 27 Aug45 - RFC 28Aug45 - NC45332 Eastern AIL L, B31Aug49 - L B Smith Acft Corp 24Mar52 - N777K Ramapo Foundry & Wheel Work - N7500A Triangle Constr Co - Hecht Constr Co, Syracuse, NY -Patterson McCarty Lsg Co, Oklahoma City, OK 1966 - ICX Avn Inc, Washington DC (1972) - Mercer AIL (1974) - Pacific American AIL (W Mercer) (Jun 77) - J Travolta, Beverly Hills, CA (Nov77) - Travol Air, Beverly Hills, CA (Jun79) - M K Wilson t/a Wofford Acft Sales, Fresno, CA R26Mar80 - Sale reported Mar83 - ?